Continuing from the previous blog article on Yin-Yang and the 5 elements, we will now delve deeper into each of the 5 elements, to see what they are all about. Are you Ready? Let’s do it! Since we are now in the Fall season, let’s start with Metal, the element associated with Fall, the time of harvest. Just as nature is letting go of what it has produced, namely, all of the fruits and veggies that are now available for our tables, letting go is one of the characteristics of the Metal element. This is the time of turning inward, of falling away from the outside, and preparing the nest for Winter. Grief and sadness are the emotion associated with this element, which makes sense when we are letting go of things. Fall would be a great time to get rid of all those items in your closet that you haven’t worn in a year or so. And, clean out expired food from the refrigerator. Think of anything else you need to let go of, to prepare for hibernation. If you take these small steps, this will help you to feel better, since you are living according to the seasons. The two organs of the body that are associated with Metal are the Lungs and Large Intestine. The Large Intestine must let go of its contents in order for us to be healthy. And the Lungs must let go of the air we inhale, since we cannot hold our breath forever. This is the time to really take care of your Lungs and Large Intestine. At this time, the Lungs are more susceptible to infections, such as colds and flu. This is the time to get plenty of rest, since rest can strengthen your immune system. It may be a good idea to take a supplement to support the immune system, such as Vitamin C or Echinacea. This is also a time to eat foods that are easy on the digestive system, such as warming, nourishing soups and stews, so that your Large Intestine will be able to function more effectively. Stay away from cold and raw foods, which put strain on the digestive system. There’s more you can do to help your Lungs stay healthy. Deep breathing exercises are also a great idea. Go outside into the fresh Fall air, and take some deep breaths. You can also massage points on the Lung acupuncture channel! 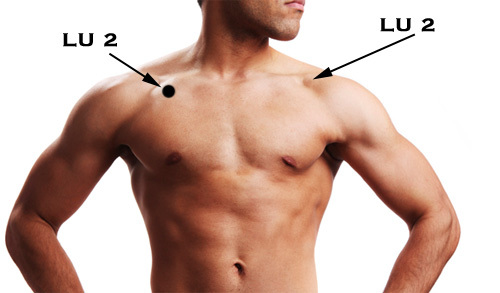 The point known as Lung 2, “Cloud Gate”, or Yun Men in Chinese, is a point located at below the collar bone, at the outer end, where your collar bone meets the shoulder. Here is a photo showing the location. You can simply massage the point while you take a few deep breaths, to encourage free flow of air and Qi throughout the Lungs. This point will increase the energy and vitality of your Lungs. Also, make sure you don’t slouch your shoulders, since this can close off this area and prevent the Qi from flowing like it should.